Join us this Friday, September 27 at 11:00 am for the grand opening of the High River Business Park! We will be opening our doors along with our other business colleagues who have been temporarily displaced from their places due to the flood. We are excited to be welcoming our community, local as well as surrounding, to help us celebrate a renewal of our High River Businesses. There's a lot happening in High River this weekend! Help us rebuild our community by supporting our businesses, and at the same time celebrating Art, Culture, watching hot air balloons sail across the sky and cars lining the streets. Here's the schedule with links to more information! Alberta Arts and Culture Days! This is where our passion lies. 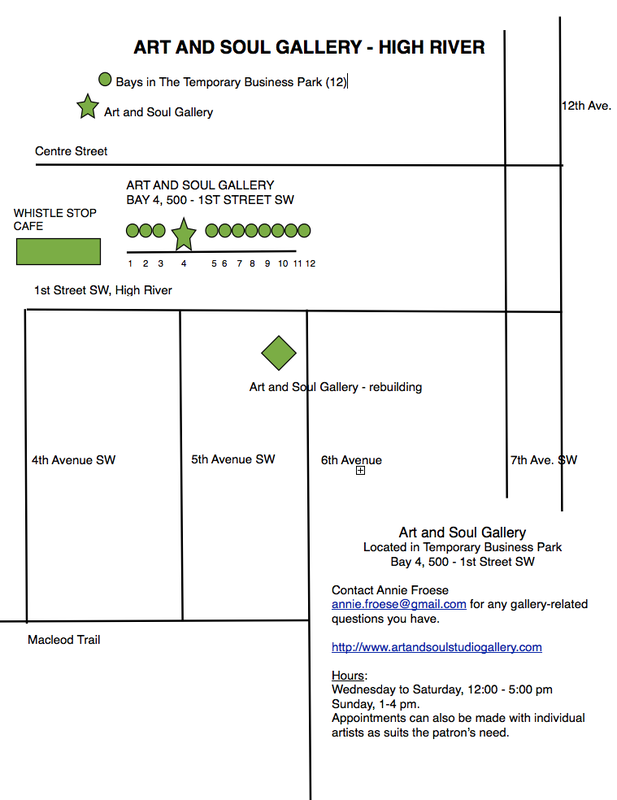 In the High River Temporary Business Park you will find three of our local galleries side-by-side!!! We will be located in Bay 4, 500 - 1st Street SW, High River. We are 4 units south of the Whistle Stop Cafe! We will be showing off our new space and hosting fresh work by our Gallery Artists. Join us for the ribbon cutting and Grand Opening Ceremonies at 11:00. Just look for the crowd! Come and see our new space and take home a beautiful painting! Help us rebuild by supporting the Arts! Annie Froese will be doing some painting demonstrations on-site. Sharon Lynn Williams will be displaying her latest automobile paintings (for sale at the tent just outside of the Gallery in Rotary Park.) She will also be doing oil painting demonstrations on Sunday. There will be demonstrations on-site every day. * Weather-permitting, Annie will have an Artist Trading Card Table set up outside for visitors to indulge their own creative callings! More about our Creative Friends! Check out their sites for more specifics on activities during the Alberta Culture Days Weekend. (Although not in the business park, Connie and Bob Pike's Studio will also be open for their show and sale). I will attach the links to these activities so that you can find out many more details. I'm looking forward to seeing many of you this weekend! Come on down and bring a friend!